The Matriculation Ceremony for all ODL Programmes holds at the Oduduwa Hall, OAU campus on Tuesday, January 27, 2015 by 12noon. Collection of the matriculation gowns commences at Oduduwa hall at 9am prompt. All students are to be seated by 11am. All Nursing candidates who have not been screened should report to the Department of Nursing, O.A.U campus on or before Friday, 23rd January, 2014. 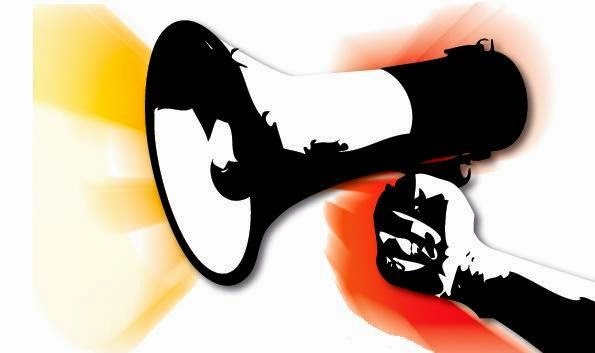 All Accounting candidates who have not been screened should report to the Department of Management & Accounting, O.A.U. campus on or before Friday, 23rd January, 2014. Please note that only candidates who have been screened will be enlisted for matriculation. Study tablets (Vigitabs) would be distributed after the matriculation and orientation on campus. It was almost a debate on Wednesday 14th January 2015 at the Afrika Amphitheatre of Obafemi Awolowo University where the Students' Union congress was held as some of the congressmen believed that the Congress was the supreme level of power in the Union, a notion the parliamentarians refused to agree with. It all began when a congressman moved a motion that a Fact-finding Committee be instituted to investigate the alleged misappropriation of funds in the execution of projects by the Central Executive Council (CEC). A parliamentarian then responded that the Students Representative Council (SRC) had already given the CEC 72 hours to give a comprehensive report of their spending after which the SRC will act. 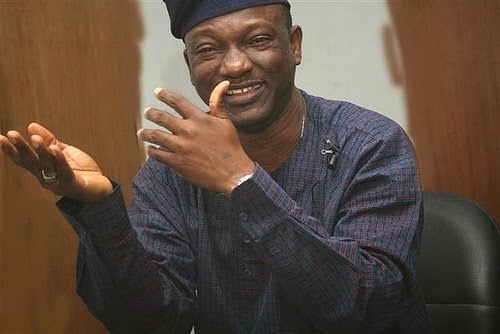 He however said the time frame had not elapsed and so the issue was not up for discussion at congress level as it had not exceeded the power of the SRC as stated in Article 2 section 6 subsection 2 of the sacrosanct Great Ife constitution. 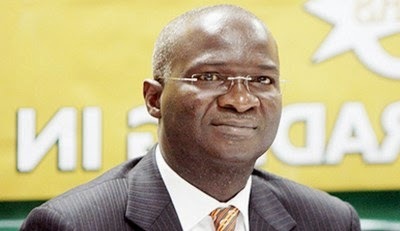 Speaking at the 2014 series of the Obafemi Awolowo Free Education Lecture organized by the Faculty of Education, Obafemi Awolowo University, Ile-Ife, Fashola said free education could only be guaranteed at the primary and secondary level. He argued that education ends at the secondary level: other activities at the tertiary level can be described as specializations. Lagos Governorship Debate: Do You Agree With Premium Times Rating? Brilliant ideas to make Lagos a better city were in abundant supply at the 2015 Lagos State Gubernatorial Debates at the Archbishop Vining Memorial Cathedral in Ikeja on Thursday, as candidates vying to become the next governor put across their plans to the public. Education, urban transportation, security and alternative ways of generating revenue for the state, and the economy dominated the discussion. Though some of the contestants clearly showed that they have no business vying for the governorship position of Nigeria’s centre for commerce, the overall performance surpassed previous debates. The contestants relied on statistics from the government, World Bank and the United Nations to buttress their points. One thing was clear to the thoroughly thrilled audience: Except for a few candidates, whoever emerges winner in the February 21 election, Lagos would be in good hands if the words said Thursday are matched with action. 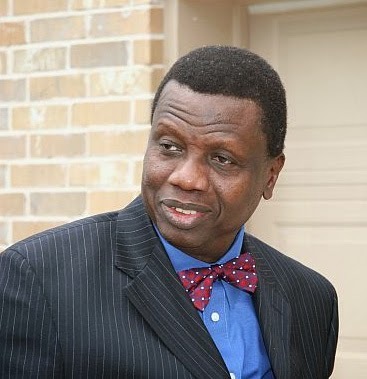 The General Overseer of the Redeemed Christian Church of God, Pastor E. A. Adeboye has said today that only God knows who will be Nigeria’s next president after the February 14 presidential election. He was present for this year's annual University Thanksgiving and New Year Revival at Obafemi Awolowo University organized by the Christian Mobilization Committee where he urged Nigerians to always pray that God's will be done. Pastor Adeboye who spoke unapologetically emphasized that he does not like Politicians because of their untruthful attitude. 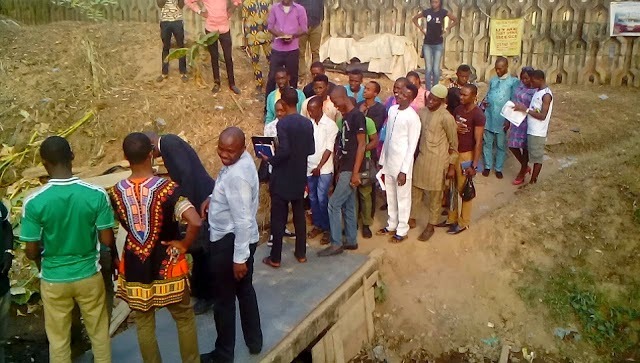 Some pre-degree students of the Obafemi Awolowo University, Ile Ife, Osun State, on Wednesday escaped being killed during the violence which erupted among the people of Ipetumodu and Ashipa communities. Our correspondent gathered late on Wednesday that the violence was caused by a boundary dispute between the two communities. It was not clear if there were casualties but it was gathered that some persons were injured in the clash. 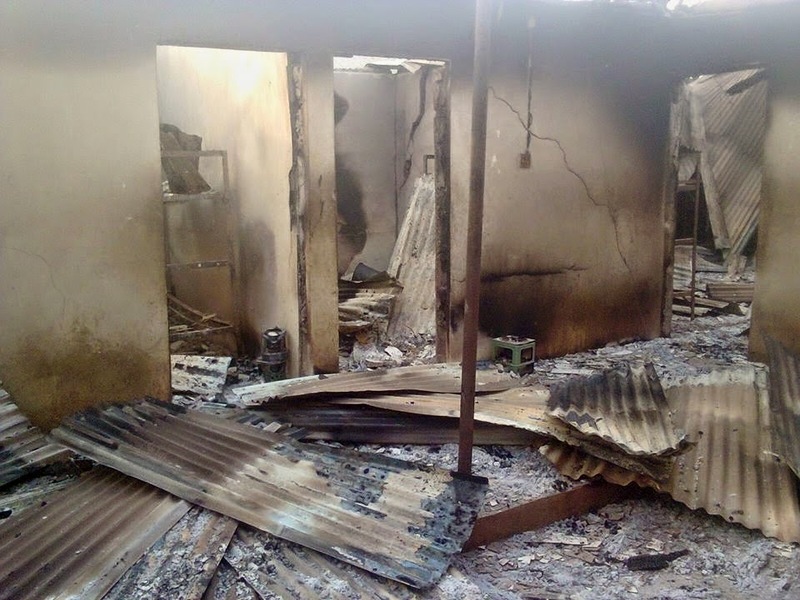 A resident of Ipetumodu, who identified himself as Taiwo, told our correspondent on the telephone that residents of Ashipa community invaded their town and set buildings ablaze including students hostels, where some pre-degree students of the OAU lived. Another resident, who claimed to be from Ashipa community, however, accused residents of Ipetumodu of being the aggressors. The congress of students that was held at the level of Afrika Amphi Theatre, Obafemi Awolowo University yesterday did not end without a show of emotional outburst by congressmen against the honourables representing them at the Students’ Union parliament. At about 40minutes behind the scheduled time, the Congress commenced with the singing of Great Ife anthem led by the suspended Secretary General of the Students’ Union, Shittu Olatayo a.k.a SI Unit. A very quick observation by a congressman challenged the functionality of the suspended Secretary General in such gathering. This went a long way to effect the unanimous position earlier taken by the SU Parliament some days ago as SI Unit had no option than to succumb to the will of the Congress. He stepped aside to join the congressmen seated. PROJECT LET GO: Exchange Your Old Cloths For New Ones For Free! 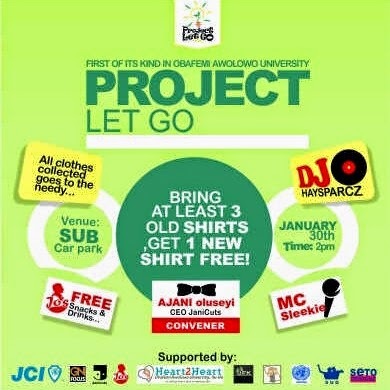 'PROJECT LET GO' is the brainchild of Oluseyi Jude AJANI, a fashion entrepreneur, strategic thinker and change agent. He is a final year student of Electronic and Electrical Engineering Department at Obafemi Awolowo University, he is also the CEO, JANICUTS- OAU, a trailblazing fashion brand. A brand known for making shirts, foot wears, native fabrics and so on. He believes in making the world, most especially his country, Nigeria a better place and letting every person, one at a time, enjoy life. 'Seyi Ajani is of the Obama philosophical school of thought that 'change will not come if we wait for some other persons, or if we wait for some other time.' We are the ones we've been waiting for. We are the change that we seek. One of the reinstated students of Obafemi Awolowo University, Ile-Ife who was suspended sometimes last semester, Pele Obasi Joshua a.k.a Chocomilo has expressed gratitude to God and the generality of Great Ife students for their support while he was suspended by the school authority. Chocomilo who was part of the recognized students who gave submissions during the Congress of students, held the atmosphere at stand still as he spoke deeply from his experience while he served the suspension served him by the authority. Did you apply for any of the INEC Ad-hoc jobs at the upcoming 2015 General Elections and you are you still doubting if the much publicized submission of Acknowledgement slip and Admission Letter at the INEC office in your state is not real? I am happy to tell you that it is VERY REAL! The submission is not only going on in Osun state. Other states' INEC offices have started to collect those documents from applicants too. States confirmed to have started receipts apart from Osun state include Ondo state, Lagos state, Oyo state and others. Submission will be to the INEC office of the state you will be posted to work i.e the state you chose as your residential address while applying online. For instance, as a student of OAU, I live in Lagos and put down Lagos as my residential state while applying online, then I will have to submit to the INEC office in Lagos. 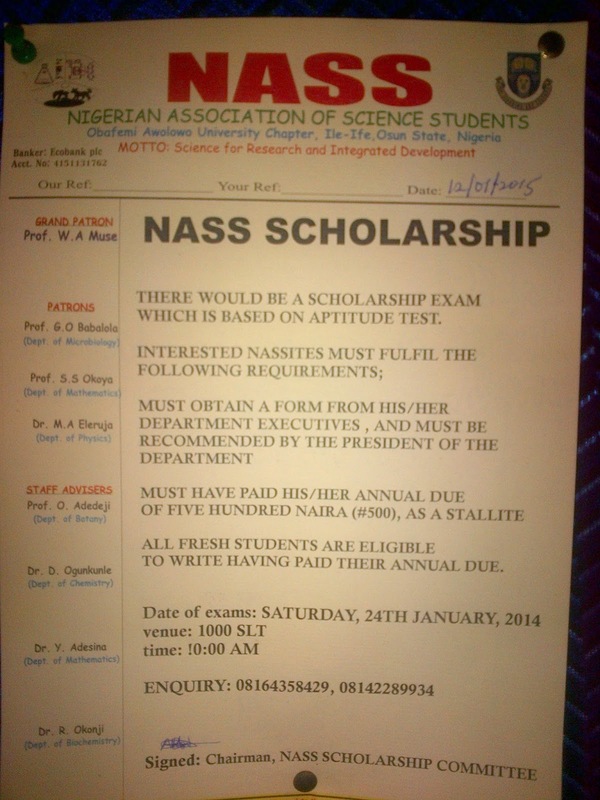 The National Association of Science Students(NASS), Obafemi Awolowo University chapter has announced a scholarship scheme for the students of the faculty of science. In a notice pasted around departments of the faculty, the scholarship will be given to deserving students that perform well in the aptitude test to be conducted. "There will be a Scholarship which is based on aptitude test. Must obtain a form from his/her department executives and must be recommended by the President of the department.Must have paid his/her annual due of N500 (As a stalite)All fresh students of the faculty are eligible to write the aptitude test having paid their annual due.Date of Exam: Saturday, 24th January 2015. Obafemi Awolowo University, Ile-Ife, Osun State invites applications from suitably QUALIFIED CANDIDATES FOR ADMISSION INTO Full-Time and Part-Time Postgraduate programmes of the School for the 2014/2015 Academic Session. Note: Obafemi Awolowo University does not have any outside agent to help with the 2014/2015 postgraduate admission exercise. The use of such agent is at candidate’s own risk and candidates should desist from using third party in processing their applications. THE PROGRAMMES AVAILABLE ARE: Postgraduate Diploma (PGD); Professional Masters (MBA, MPA, MIR, M.Arch. MM Psych, LL.M. etc); Masters with Research Thesis (M.Sc., M.A, M.Phil.) and Doctor of Philosophy (Ph.D.) Degree Programmes. 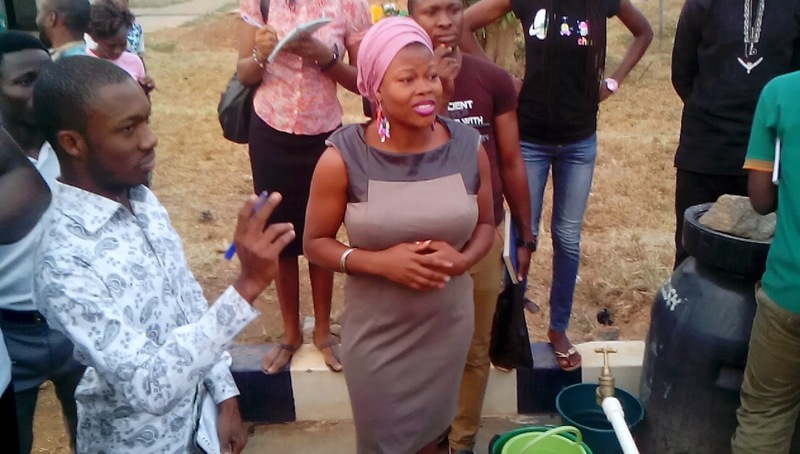 The Chairperson of Mozambique Halls of Residence, Miss Ashimolowo Jumoke has described the water project executed by the Central Executive Council of the Ibikunle-led administration in her Hall as a white elephant project. As parts of projects earn marked for inspection by the Union officers during the Union's inspection tour, the completed water system installation in Angola Hall and the one located at the upper part of Mozambique Hall were inspected by teaming stakeholders of the Unions including press men. In what seems to be a deal gone sore between the Hall Executive Council(HEC) members of Mozambique Hall and members of the Central Executive Council(CEC), the Chairperson of the Hall repeatedly affirmed that the waster installation in her Hall has not lived up to its expectation as it does not serve any meaningful purpose since it has been completed. "This is not serving Mozambique queens"
Ibikunle-led administration inherited N1.4m from Fjay's tenure OAU Students' Union acquire 2 aluta jetsThe 11th of January, 2015 was set by the administration of the Students’ Union to bring Press men/ladies and Student Stake Holders together for an interactive session on the projects embarked on and to inspect the projects. 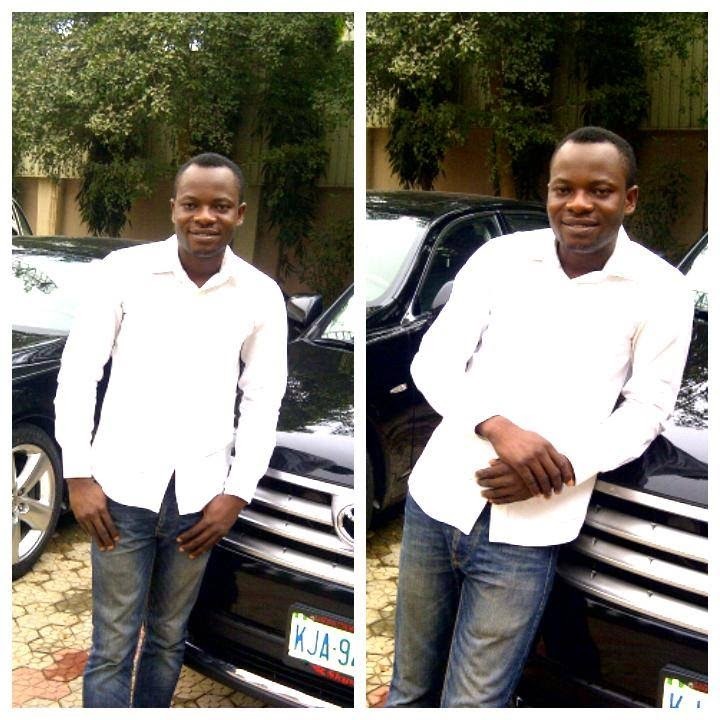 January 1st, 2015 was a day to cherish for Oluwasegun Famisa, a first class graduate of Obafemi Awolowo University (OAU), Ile-Ife, as he celebrated the new year with a gift of N1 million from popular Nigerian philanthropist, Ali Baba Akporobome. 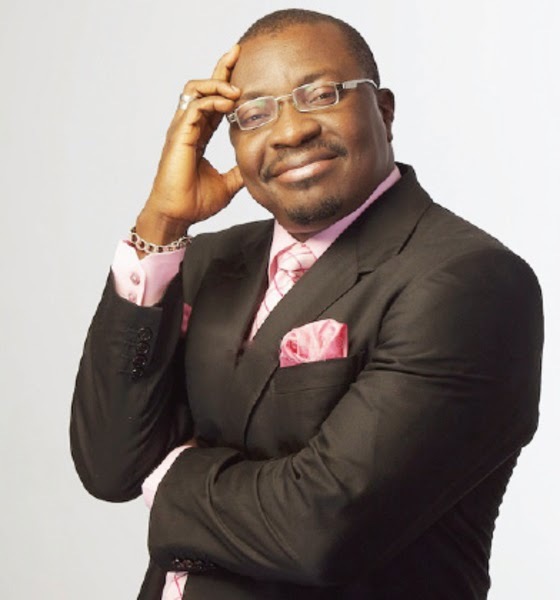 The Electrical Engineering graduate got the cash reward for his outstanding academic performance during the January 1st Concert organized by the King of Comedy, Ali Baba, at the Eko Hotels convention centre. Oluwasegun also got a job offer from the Executive Director of Heritage Bank, Mrs. Mary Akporobome, who is also the wife of Ali Baba. The first class graduate expressed his happiness at the event and thanked Ali Baba for the gifts. 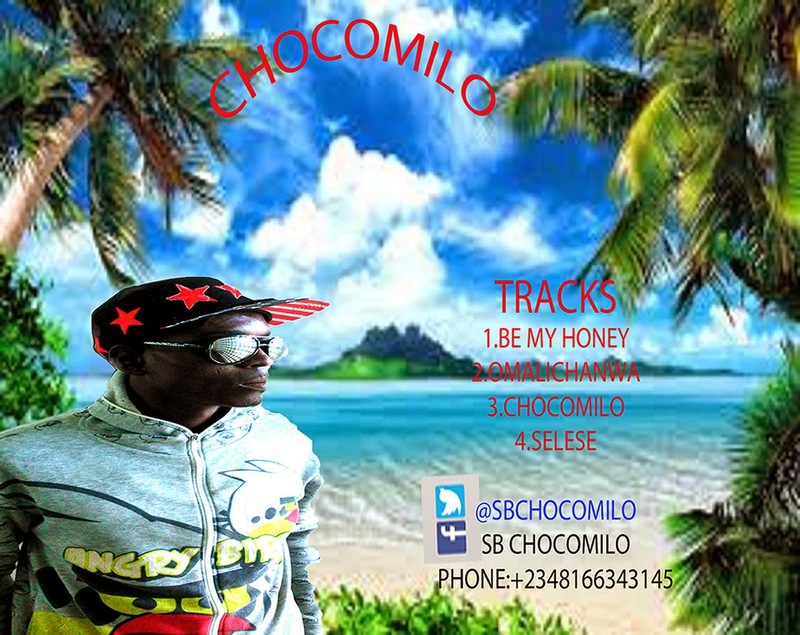 He promised to continue working hard in any environment he finds himself in order to be the best. Top comedians like Omo Baba, Okey Bakassi, Bovi, Koffi, Funny Bone, AY, Princess, Helen Paul, Sheyi Law and a host of others made the event worthwhile with their rib-cracking jokes. Real Madrid attacker Cristiano Ronaldo has won the 2014 Fifa Ballon d'Or ahead of Bayern Munich goalkeeper Manuel Neuer and Barcelona forward Lionel Messi, scooping up the prestigious individual award for the third time in his career. Ronaldo enjoyed a hugely successful 2014, in which he guided Madrid to Champions League glory by netting a record 17 goals in one campaign, and earned 37.66 per cent of the votes. On an individual level, the 29-year-old won the Liga top scorer award by scoring 31 goals in 30 appearances, which also saw him crowned joint-winner of the European Golden Shoe together with Luis Suarez. 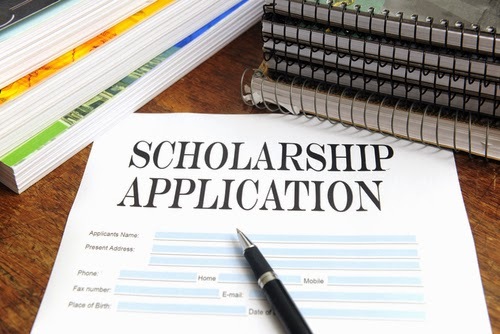 As 2015 begin, as an undergraduate in Nigeria, it is very important to keep these scholarship opportunities in mind. I have compiled a list of scholarship opportunities that you can apply for this year 2015.